This month’s Mixology Monday is hosted by blog pal Rumdood, one of the small handful of cocktail bloggers I’ve had the pleasure of meeting in person. (And it’s going to remain a small handful a little while longer: I learned last week that, contrary to my initial plans, I won’t be able to attend Tales of the Cocktail in New Orleans next month.) Rumdood’s chosen theme is ginger. Shake all of the above with ice and strain into a cocktail glass, garnishing with a twist of lemon. Ginger and Fernet pair very well and the whole drink comes together nicely. If you have a taste for cocktails with a strong bitter component, this is one to try in the summer months. *Updated 9/1/09: Since publishing this I’ve been upping the amount of lemon juice used, a change now reflected in the recipe above. **New Update 9/29/11: I recently revived this recipe for Metrovino and altered the recipe yet again. Instead of Domain de Canton I’m using a ginger syrup made by simmering fresh ginger with equal parts sugar and water. Nothing against Canton, which is delicious in this drink, but the syrup does just as well and allows us to keep the price down. 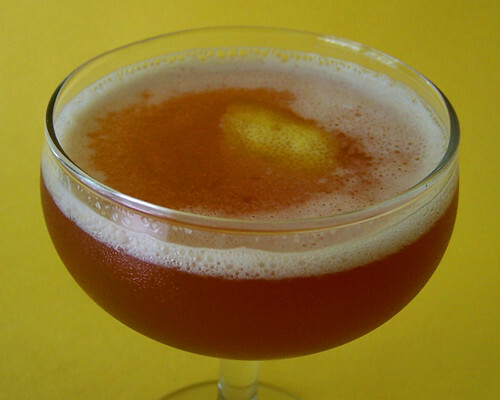 Pingback: Mixology Monday XL: Ginger!